l Raspberry Jalapeno Jam-19 oz. Home > Shopping Store > Jams & Condiments Shopping Cart > Raspberry Jalapeno Jam-19 oz. 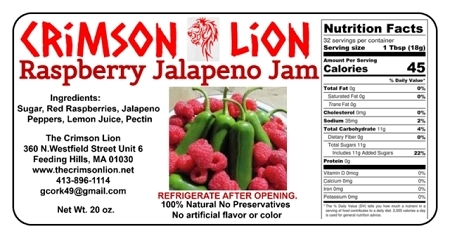 Raspberry Jalapeno Jam is one of the best sellers for The Crimson Lion. This product flavor is loved by our customers. Some customers are hesitant when they first see "Jalapeno" but when they try it they love it as there is a very minimal bite. The combination of red raspberries, sugar, jalapeno peppers, lemon juice, and pectin creates the most delicious Raspberry Jalapeno Jam. We suggest adding a round of brie cheese or cream cheese for dipping sauce. Get your crackers out and enjoy.